Our expectations increase each school year. Next week, Chicago Public Schools students and teachers on the regular calendar return to the classroom. For all teachers, arguably, the question is, "How will I manage this year's classes?" For each teacher, the concerns are different. At the high-school level, my priorities are instilling respect, increasing engagement, and fostering dedication. This is my 18th year as an educator. I know how to teach. I know the Southwest Side. But each group of students is different. I learned classroom management techniques from elementary school teachers that we deem inappropriate for young adults: routines, bulletin-board acknowledgements, yellow warning tickets. This year, I’ll be trying out strategies from Discipline in the Secondary Classroom by Sprick. The underlying belief of all these strategies is that our young people can make good choices, that they want to be productive, that they are capable of learning, and that they need to lead, not just follow. They also need to know that a bad decision can result in detention. Even after 17 years, I still surf the Web for classroom-management techniques. Someone always has a better idea to engage students. But there’s one resource that obstructs our students’ potential. 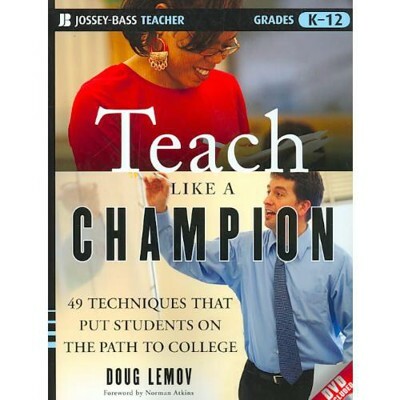 Teach Like a Champion by Doug Lemov is gaining popularity—especially in low-income schools—as the vaccine for bad classrom behavior. Chicago's Academy for Urban School Leadership (AUSL) adopted it as a core text for its teaching-training academies. In 310 pages, 49 techniques, and 1 DVD, teachers learn how to control their students in meticulous ways. Despite the the author's view that these techniques put students on the path to college, this book perpetuates the culture of low expectations among low-income youth. The book glorifies teachers who do the minimum. In truth, these techniques are rudimentary classroom-management approaches—not championship teaching. Technique 27, for example, is called Vegas: "The sparkle, the moment during class when you might observe some production." Here’s what it looks like on page 142 when students "discuss" the sentence "Mom put the baby in the crib." Teacher: Here is our verb, put, and at the end comes a phrase, in the crib. What kind of phrase is it, Charles? Charles: It’s a prepositional phrase. Teacher: And between the two, Shayna? What’s that? Shayna: It’s a direct object. Impressed by the magic of learning? The "Vegas" of it? I'm not. These strategies should not earn any teacher a championship belt. Classroom management is a basic part of teaching--so is call-and-response. Good teaching begins with effective classroom managment. Champion teachers transcend this with lessons that go beyond recall and identification. Champion teachers help students analyze, synthesize, and thoughtfully evaluate. If Lemov's techniques truly helped students think critically, kids would soon realize how ordinary these approaches are. In DVD clip 5, we see a teacher using the technique "Format Matters" to correct a student from saying "it gots" to "it has." He just makes the student repeat it correctly. Teaching students standard grammatical format is essential, not championship teaching. In clip 14, the teacher stares down at her students, moving her eyes side to side, like she’s ready to play Whack a Mole, preparing to slam down anyone who does not comply. At her signal, students grab one sheet from their packet in one hand and the rest of the packet in the other. They lift these over their heads. On the count of two, the students systematically snap away their homework and slide the single sheet in their folder. The teacher's efficient. The students have their homework. But the teacher doesn’t deserve a championship belt. Is the homework worth completing? Another troubling part about Lemov’s book is that he wants teachers to make the distinction between acknowledgement and praise by "acknowledging when expectations have been met and praising when the exceptional has been achieved" (211). In other words, if students are on time for class—acknowledge it. If they write a great paragraph—praise it. Lemov's book, however, is praising when it should be acknowledging. At my new high school last week, I listened to a researcher who talked about helping students write their own counter-narratives. Instead of fulfilling the expectations of meek, passive, and low-achieving stereotypes, we need to teach so our low-income black, brown, and even white students create realities that contradict the history of oppression. The question this researcher wants us to ask when we see perfectionist discipline is, "What are students being socialized to do?" In Teach Like a Champion, students are being socialized to be passive, mob followers. They are being taught that recall of information is all they can, should, or be expected to do. The researcher also questioned why schools must institute militaristic, penal-system practices before they believe our students can learn. My response is that the priority in these schools is control--not learning. At last summer's workshop where I was supposed to train for my championship belt, out of all the DVD clips we watched, only two had black teachers in front of black students. I raised my hand and said, "It’s interesting that these are the only clips where the teacher looks comfortable and happy." The white presenters’ faces looked at me expressionless, paranoid. They searched the crowd for a neutralizing comment. My Latina colleague at the table smiled and whispered, "Oh, no you didn’t." She was glad I did. And I did choose to leave that AUSL high school at the end of the first semester. I could not commit to their misguided teacher-training philosophy or the deficit-based view they had of me and our students. AUSL, however, will continue teacher training in about fourteen more schools with the mayor's blessing. I believe in discipline. I promote orderly hallways. I am strict. But I'm not oppressive. Lemov's strategies highlight the paranoia that many white teachers, and some teachers of color, feel when they enter our schools. They fear. I know not all white educators fear. I know not all black and brown teachers are good. I know a college-prep education encourages students; it does not dominate them. Champion teachers maintain order because it leads to meaningful learning. But Lemov rarely or ever discusses what is being taught. He assumes the worksheets are valuable. That's a risky assumption in teacher training. "Is that a run-on sentence?" Well, how would you know?" "There would be two subjects and two predicates." "If I wanted to prove it, which of those would I start looking for first?" Question. Recall. Question. Identify. Over and over. True championship teaching rests on the idea that low skill level does not mean low intellectual ability. And it moves beyond the idea that low-income students must start with the lowest level skills. There are many high-achieving readers and writers on Chicago's Southwest Side. These techniques will do little for them. Finally, dishearteningly, Lemov's book contributes to the de-professionalization of teaching. He sends the message that anyone can do it--if they read the right manual. What other classroom-management strategies should teachers avoid or use this school year? A version of this post originally appeared on this blog on September 5, 2011, but it's an important issue that needs more conversation.